Here in California, Adult Protective Services (APS) receives more than 15,000 reports of elder and dependent adult abuse per month, and reports are increasing. 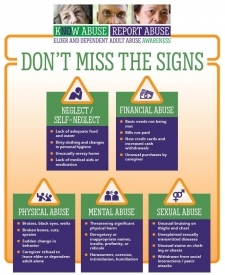 There are an estimated 184,500 cases of reported elder and dependent adult abuse PER YEAR in California. 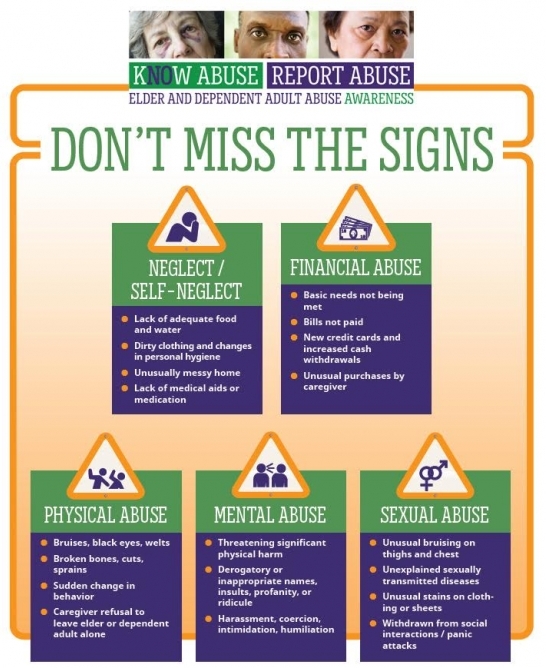 Elder abuse is significantly underreported. For every case known to programs and agencies, 24 are unknown. For financial abuse, only one in 44 cases is known. 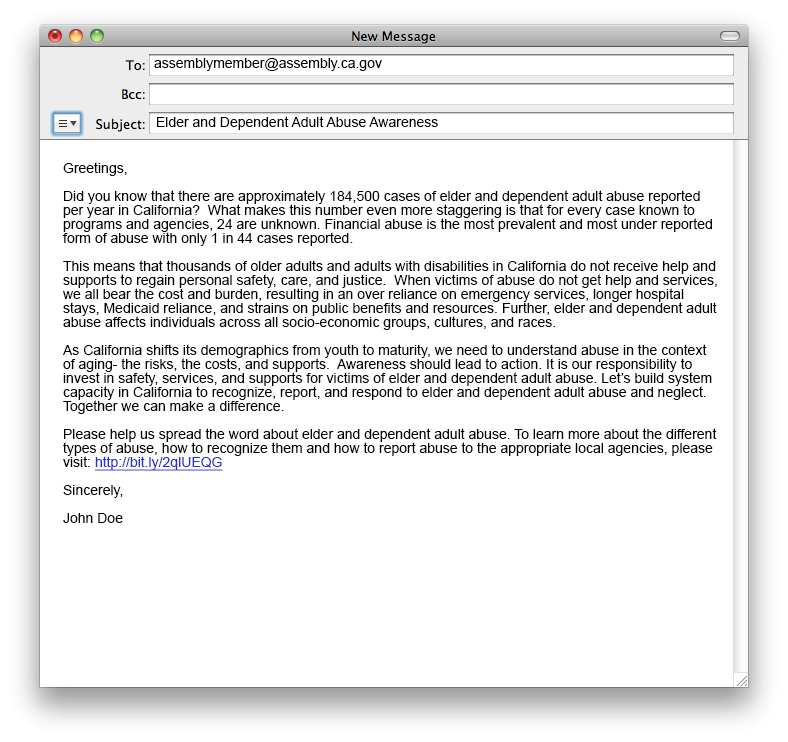 Help the California Association of Area Agencies of Aging and partners around the state to raise awareness about elder and dependent adult abuse. Learn about the different types of abuse, how to recognize them and how to report abuse to the appropriate local agencies. Enter in your name, email and zip code and we will provide a draft email to send to your local official. Self-Neglect – Refusal or failure to provide himself/herself with adequate food, water, clothing, shelter, personal hygiene, medication (when indicated), and safety precaution. Physical Abuse – The use of physical force that may result in bodily injury, physical pain, or impairment; or any physical injury to an adult caused by other than accidental means. Neglect by Others – Failure to provide the basic care, or services necessary to maintain the health and safety of an adult: this failure can be active or passive. Sexual Abuse – Sexual contact with a non-consenting adult or with an adult considered incapable of consenting to a sexual act. Financial Abuse – The illegal or unethical exploitation and/or use of an elder’s funds, property, or other assets. Mental Abuse – Verbal or emotional abuse includes threatening significant physical harm or threatening or causing significant emotional harm to an adult through the use of: Derogatory or inappropriate names, insults, verbal assaults, profanity, or ridicule; or harassment, coercion, threats, intimidation, humiliation, mental cruelty, or inappropriate sexual comments. Abandonment – the desertion or willful forsaking by anyone having responsibility for care. Isolation – Preventing the individual from receiving mail, telephone calls, or visitors. To report In-Home Supportive Services (IHSS) provider fraud, call 1(888) 717-8301 or 1(800) 722-0432. To be connected with ElderCare Locator, a nationwide service that connects older Americans and their caregivers with trustworthy local support resources, call 1(800) 677-1116. California law mandates that certain individuals report known or suspected incidences of elder or dependent adult abuse. Failure to do so is a crime. WHO: Persons who are responsible, in whole or part, for care or custody of an elder or dependent adult, whether or not that person receives compensation, are mandated reporters of elder and dependent adult abuse, including: administrators, supervisors, and any licensed staff of a public or private facility that provides care or services for older or dependent adults, or any elder or dependent adult care custodian, health practitioner, or employee of a county adult protective services agency or local law enforcement agency. In addition, all officers and employees of financial institutions are mandated reporters for suspected financial abuse of elders and dependent adults. WHEN: By telephone immediately, or as soon as practically possible to the appropriate local agency: adult protective services, law enforcement, and/or long term care ombudsman; AND, by written report, California Department of Social Services Form “Report of Suspected Dependent Abuse/Elder Abuse” (SOC 341), sent within two working days.